Clean, dignified, sleek and contemporary; our Stainless Steel and Teak Backless Benches are the perfect combination of materials, making a modern bench that suits many spaces. 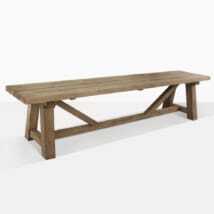 The Stainless Steel and Teak Backless Bench has become a stalwart favorite at Teak Warehouse because of its incredibly elegant design. Both modern and timeless, this is a bench that oozes appeal. 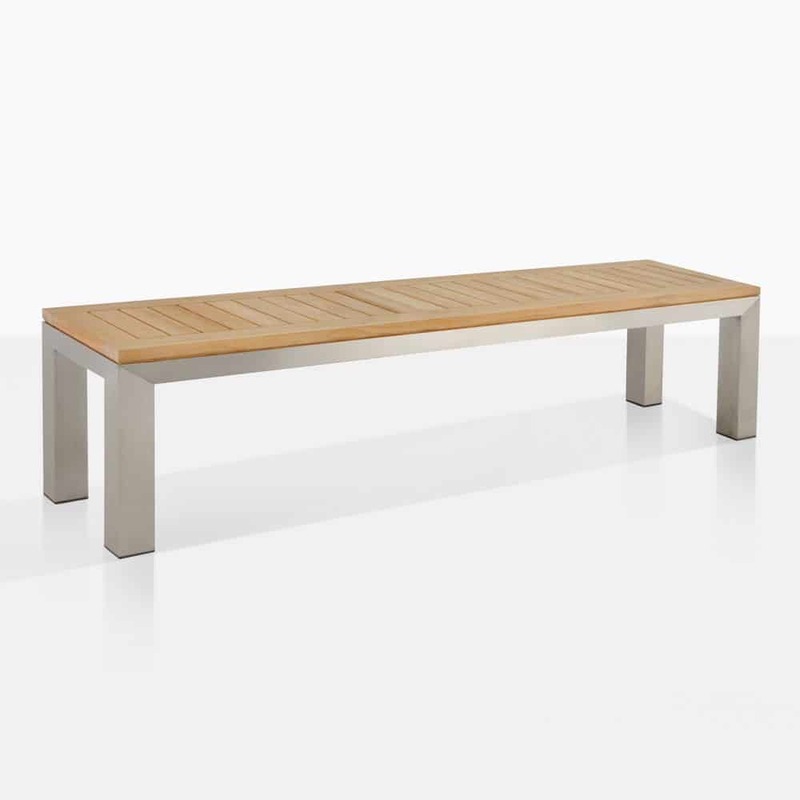 Made with a chic #316 Stainless Steel frame; thick, sturdy and completely marine grade and featuring an elegant A-Grade Teak seat; comprised of slender, tightly placed slats; this is a Bench seat that looks beautiful as a singular piece in the garden, against a wall, or placed with many styles of table. #316 Stainless Steel is marine grade, meaning it wont rust or corrode outdoors, and making less work for you! 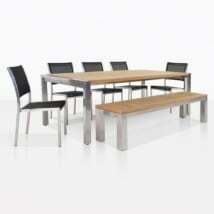 Coupled with A-Grade Teak, the Stainless Steel and Teak Backless Benches are a recipe for success! A-Grade Teak is given the grade because it is the best part of the teakwood. We use timbers cut once the teak tree has reached the ripe age of at least 40 years, meaning the wood has had time to generate rubber and oil content unparalleled to other woods – this is the stuff that lasts a lifetime! Whether you let it weather naturally or seal or oil it to keep the honey color, our A-Grade Teak is extremely easy to maintain! Just wash it down a few times a year with Simple Green or another non-abrasive cleaning product, follow the grain of the wood with a brush or sponge and enjoy as your teak looks even more beautiful as years go by! Teak Warehouse has many options for your outdoors – from amazing Reclaimed Teak to Raw Concrete, Resin, Aluminium, Sunbrella®, Textilene® and Batyline® fabrics as well as several options for all weather wicker! So whether you’re craving custom cushions for your deep seating, designing a modern dining set, creating an oasis of calm with the relaxing chair or sun lounger range – we have everything you need! At Teak Warehouse, our sales assistants are in store 7 days a week and happy to help you configure your space, give ideas for different options. Our business is your furniture! Call us today to arrange a quote for the items you desire and the shipping you require! 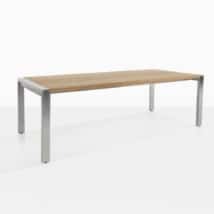 Try the Stainless Steel and Teak Backless Bench with one of our Stainless Steel Tables for an ideal match, or dress up a simple teak table in a chunky style. 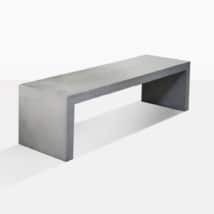 You may like to create a very modern, mixed medium look, then pairing one of the Square Dining Table in upmarket Raw Concrete up with four of these majestic benches. Perhaps try the Stainless Steel and Teak Backless Bench indoors for a modern edge to your traditional dining table – your guests will be impressed with the stunning mix of contemporary materials! 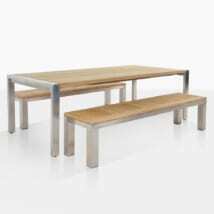 The Stainless Steel and Teak Backless Bench is available now and in 2 convenient sizes, choose a fit to suit your space. Our Stainless Steel and Teak Backless Bench is a terrific choice from the leader in outdoor furniture – trust us to bring you exceptional quality at a fraction of the cost!